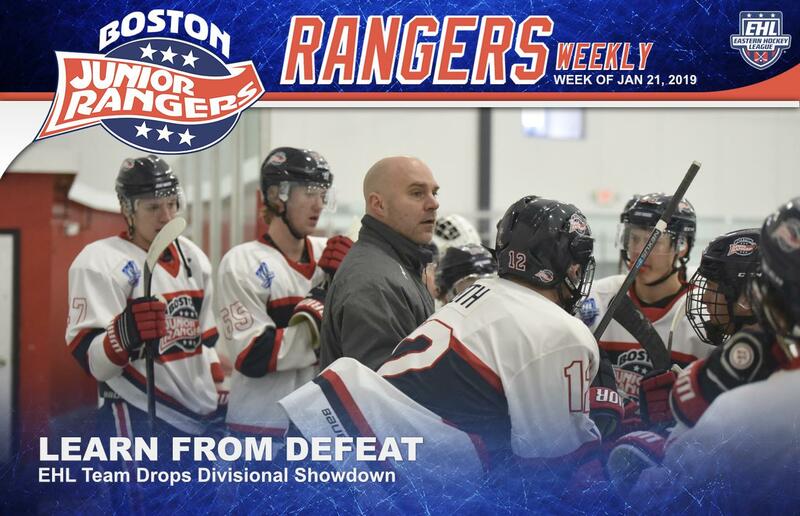 TEWKSBURY, MA -- The EHL squad fell in their only game of the week, but despite the loss, they still sit in 2nd place in their division with a record of 18-10-3. As for the EHLP team, they had the week off after the league was forced to cancel the final showcase of the regular season. On Friday, the Rangers traveled up to Hooksett, NH and looked to gain some ground on the 1st-place New Hampshire Avalanche. The Avalanche took an early 2-0 lead, but Andrew Keith cut the deficit in half with a short-handed goal at the 8:33 mark of the 1st period. However, the Avalanche scored a pair of goals in the 2nd frame and took a 4-1 advantage going into the final period. Keith found the back of the net yet again early in the frame, for his team-leading 17th goal of the season. Cam Roberts got the Rangers a goal closer just a minute later, but unfortunately, it wasn't enough, as the Avalanche added an insurance goal late in the period and won by a final score of 5-3. Aiden Curry did all he could in net, stopping 48 shots in the loss. Both Rangers squads will get back to work this week with a busy slate of games. The EHL team will travel to Haverhill, MA to face-off against the Valley Jr. Warriors on Wednesday, before hitting the road for New York on Saturday to match-up against the New York Applecore. Before coming home, the EHL team will finish off their week with a game against the Connecticut Chiefs on Sunday. The EHLP squad on the other hand, will stay at home and face-off against the Walpole Express this Saturday night.